KIEV, Ukraine -- Five Russian generals are playing a key role in organizing and commanding separatist forces inside Ukraine, according to a dossier provided by Ukraine's security service to the Obama administration last month. 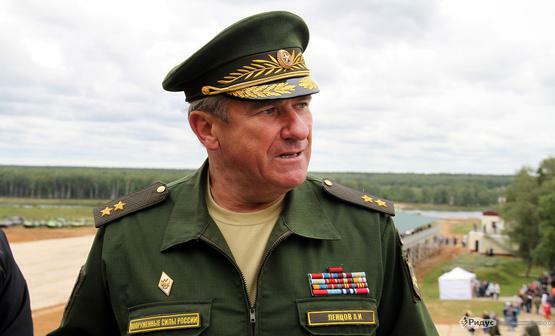 Lieutenant General Alexander Ivanovich Lentsov, the deputy commander of Russian ground forces, who has also been accused of having a role in commanding Russian troops aiding the separatists. Lentsov is a veteran of the Soviet war in Afghanistan and the Chechen Wars. The document, obtained by us, is a consensus product of the Security Service of Ukraine and dated June 16. It identifies five Russian generals and a Russian colonel as playing a senior leadership role inside Ukraine. The Kremlin has repeatedly denied that Russian military personnel are directing military operations inside the country. Top Ukrainian intelligence officials shared the document with White House, State Department and U.S. intelligence officials in Washington late last month. U.S. officials have confirmed receiving the document and told us that the information it contains generally conforms to U.S. intelligence assessments of Russian activity inside Ukraine. For more than a year, U.S. and NATO officials have accused Russia's special operations forces and its military intelligence agency of aiding separatists in Ukraine. The Ukrainian intelligence document goes further than previous public information by accusing specific Russian generals of being involved. These include Major General Oleg Mussovich Tsekov, who it says commands two brigades of the Luhansk People's Militia, and Major General Valerii Nikolaevich Solodchuk, accused of commanding the first army corps of the separatist Novorossia armed forces in Donetsk. Other officers named include Major General Sergey Yurievich Kuzovlev, who it says commands regular Russian military operations in the Luhansk region and Major General Aleksei Vladimirovich Zavizion, who commands and coordinates Russian military operations in the Donetsk region. The dossier identifies Major General Roman Aleksandrovich Shadrin as the minister of state security for the Luhansk People's Republic. It also says Colonel Anatolii Konstantinovich Barankevich, a former minister of defense for the Georgian breakaway republic of South Ossetia, serves as an adviser for combat readiness for the Luhansk People's Republic. Mark Galeotti, an expert on the Russian security services at New York University, told us that the Ukrainian intelligence document for the most part confirmed what he has learned about Russia's role in Ukraine. He said the identification of the Russian generals represented an important development. "Up to now you have seen Russians lieutenants, captains and majors in Ukraine," he said. "But now they are actually embedding their senior officers; these are Russian commanders." Galeotti said this signaled that Russia wanted a more permanent influence over Ukrainian separatists. "It's a control issue, to make sure maverick commanders don't prosper," he told us. "Somewhere in Moscow they have made the decision this will be a long-term frozen conflict." The Russian military has confirmed that a small military contingent has been deployed inside Ukraine, at the request of the Kiev government and with the mission to help the Organization for Security and Cooperation in Europe implement the Minsk agreement on the ground. There is a Joint Center for Control and Coordination set up to oversee the implementation of the Minsk agreement. The Russian general that has been attached to the center as part of the agreement is Lieutenant General Alexander Ivanovich Lentsov, the deputy commander of Russian ground forces, who has also been accused of having a role in commanding Russian troops aiding the separatists. “They are of course only accusations that General Lentsov is responsible for orchestrating and commanding some of the Russian troops on the ground in Ukraine, but it does seem plausible that he and his staff maintain contact with the other commanders in eastern Ukraine,” said Hannah Thoburn, Eurasia analyst at the Foreign Policy Initiative. The 30-page dossier provided to Congress and the U.S. government also represents an effort from the Ukrainian security services to prove to their allies that they are making progress in rooting out Russian saboteurs from Ukraine. It includes tallies and briefings on military intelligence suspects arrested by Ukraine. The dossier reports that Ukrainian intelligence services believe there are just under 9,000 Russian regular army soldiers currently deployed inside Ukraine, organized into 15 battalion tactical groups. That estimate could not be independently confirmed. The Ukrainians also contend that Russia continues to pour heavy weaponry into Ukraine, an accusation often echoed by senior U.S. officials. Those weapons include tanks, armored personnel carriers, and anti-aircraft missile systems similar to the one that accidentally shot down Malaysian Airlines flight MH-17 over Donetsk last year. On Capitol Hill, there’s bipartisan support for giving the Ukrainian military defensive weapons, given the Russian actions, but the Obama administration has made clear they have no intention of going beyond the limited non-lethal assistance that is currently being provided. “There are still incursions on the borders, they are still interfering in the sovereignty of Ukraine,” said Senator Ben Cardin, the top Democrat on the Foreign Relations Committee. Senate Armed Services Committee Chairman John McCain traveled to Ukraine last month and met with Ukrainian political, military and intelligence leaders. He said the Ukrainians are outmatched by a Russian-supported force that has better technology and better intelligence. “They’ve got 20th century weapons against 21st century weapons,” McCain said.